We are stardust – no, really! The elements in our bodies were created by supernovas — stars that exploded long ago. But now astronomers believe that some of those dying stars met a different fate. 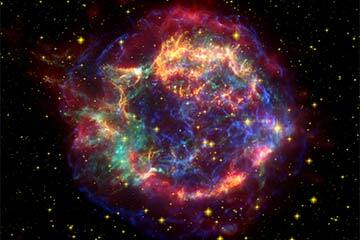 When massive stars explode and collapse they can turn into small dense NEUTRON STARS. Under extreme gravity, the atoms in neutron stars flatten into layers. Picture a tray of really dense lasagna. Packed super tightly, a teaspoons’ worth weighs as much as Mount Everest! A team of American and Canadian scientists were curious: How strong was this incredibly heavy nuclear pasta? It’s impossible to study these gigantic stars in a tiny lab. So the team used computer simulations instead. Their simulation placed a ton of weight on top of the virtual lasagna. Ultimately the space pasta splintered. How much force did it take? Ten billion times that needed to shatter steel! That makes this “nuclear pasta” – or neutron stars – the strongest material in the known universe! And, a noodle dish that’s truly al dente!